On the 13 November 2018, HJA’s LGBT+ Network hosted its first external event focussing very much on the T of LGBT, transgender. The event was an insightful panel discussion on trans experiences in the workplace. 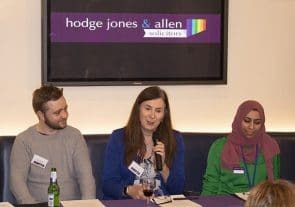 The diverse panel members included Emma Cusdin, trans and HR consultant, Luke Williams, trans lawyer and lecturer, and Homa Wilson, HJA’s employment partner, who all shared their experience and knowledge. The purpose of the event was to raise awareness of the issues faced by the trans community across many aspects of the working environment, discuss the advantages and flaws of our current discrimination laws, and highlighting the ways in which employer and allies can foster an inclusive environment. in some cases some employers openly acknowledging that would be less likely or unsure to hire an applicant who is trans. This problem is further complicated in the individual’s choice whether or not to come out as trans during an interview. It is unlawful to discriminate against someone who is proposing to, is in the process of or has undergo gender reassignment. There’s no requirement to provide medical evidence of the transition. The law protects such individuals if they are refused a job on grounds of gender reassignment, or are subjected to harassment in the interview process. The employer should make the application process welcoming for trans individuals. Best practice would include trans inclusivity statements in all job advertisements, application forms and corporate branding, letting a prospective trans applicant know that the environment is an LGBT+ inclusive one. Active training for the hiring manger/recruiter on identifying and addressing potential issues. Be receptive to conversations if a trans colleague is open to having one. Do ask questions but be mindful of overstepping the mark on prying into very personal details if unprompted. If a trans person comes out to you it is huge sign of trust. Speak to them as human beings not aliens. The employer should consider active training on trans awareness and inclusivity across all levels from seniors to juniors. This does not mean forced mandatory training. But perhaps small discussions and group work with trans led organisations. The employer should ensure trans inclusive policies that are human and holistic, not cold and inaccessible. A key tip would be to have the trans person squarely in mind when drafting and seek their valued input. Once the policy is enacted, ensure it is understood and followed rather than blindly sending it out. Let the trans employee set the pace and tone of their transition. Appreciate that no two journeys are the same. Employers should have a transition action plan, agreed with the employee, on how to implement changes (if any). Sensitivity and disclosure is vital, so think of the person behind transition policy. Fellow employees and employers could find themselves personally liable for discrimination and harassment claims brought by someone who is, or is proposing to transition and so awareness is as much about educating and safeguarding against the wrong types of behaviour as it is about empowering trans employees. There is no explicit right for time off work for transitioning. An employer cannot apply their absence policy in a discriminatory way by treating a trans employee less favourably compared to someone who is not trans or transitioning. Our society is moving faster than the law and in order for the law to change greater openness towards gender identity, self-identification and appreciation of gender as a spectrum is needed. The current Gender Recognition Act 2004 is very medicalised at present. This is at odds with the vast majority of trans people who do not want medical intervention. This is a broad overview of the topics discussed at the event. Useful information on managing trans issues in the workplace can be obtained from trans specific organisations such as Global Butterflies, Gendered Intelligence, Stonewall, and ACAS.